The Prophet said: ‘Charity is a necessity for every Muslim.’ He was asked: ‘What if a person has nothing?’ The Prophet replied: ‘He should work with his own hands for his benefit and then give something out of such earnings in charity.’ The Companions asked: ‘What if he is not able to work?’ The Prophet said: ‘He should help poor and needy persons.’ The Companions further asked ‘What if he cannot do even that?’ The Prophet said ‘He should urge others to do good.’ The Companions said ‘What if he lacks that also?’ The Prophet said ‘He should check himself from doing evil. That is also charity. Say: “Verily my Lord enlarges and restricts the Sustenance to such of His servants as He pleases: and nothing do ye spend in the least (in His Cause) but He replaces it: for He is the Best of those who grant Sustenance. So fear Allah as much as you are able and listen and obey and spend [in the way of Allah ]; it is better for your selves. And whoever is protected from the stinginess of his soul – it is those who will be the successful. If you loan Allah a goodly loan, He will multiply it for you and forgive you. 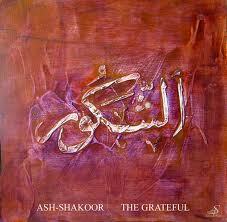 And Allah is Most Appreciative and Forbearing. Why the Sadaqah Jariyah Progam? Allah is obviously in need of no one and no thing from us, but continues to give us opportunities to continue receiving His Blessings. The Sadaqah Jariyah Program (SJP), having offiicially been established in 1995, is structured to provide the opportunities for us to consistently fulfill our worship activity of Sadaqah. The term Sadaqa denotes an act of giving from yourself but that can also provide you with benefits, a risk-free investment. Jariyah is something that is continuous and ongoing. The program is structured around the terminology, with the intent of honoring God consistently (monthly) for the Blessings He constantly showers us with. This is reason enough to give in His cause. As the Prophet Muhammad (SAW) said, “The best Sadaqa is one that is consistent, even if it is small.” The SJP is a recurring monthly contribution program,with benefits in this and the next life, that everyone is encouraged to participate in. • Discounts on ISCF services such as cemetery plots, MECCA Hall rentals, etc. • Discounts with partners such as Disney, Orlando Magic, and more. Strengthen Your Community for Future Generations! 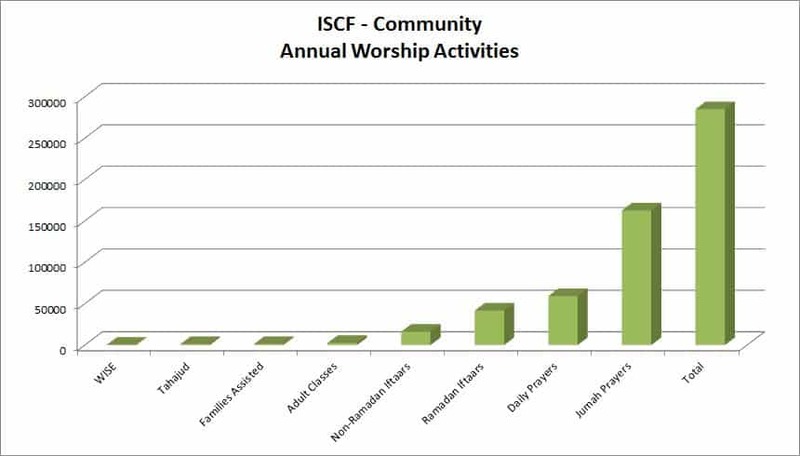 Did you know that over the past year, the ISCF community has performed over 285,000+ acts of worship at your ISCF facilities? All Praise is Due to Allah (SWT) for His Guidance and Infinite Blessings to our community. We thank you for your investment in your community by participating in the Sadaqah Jariyah Program. Your investment at work in this life is producing returns for you with Allah in the next with all the Ibadat your investment helps facilitate! Your investment today helps strengthen the foundation of our community for future generations long after we are all gone, insha Allah. By supporting our community, we will insha Allah get some credit for all the ibadat we help facilitate and make possible. May Allah (SWT) accept our intentions and efforts to work to please Him alone. As Muslims, we must be thankful and appreciative of every blessing our beloved Creator has given us out of His Love and Mercy. No matter our condition in life, we are always blessed. As practicing Muslims, we must always put God first in our lives which can make our actions into worship. We must not only be thankful for having received our gifts, virtually having never even asked for them, but also to receive God’s Gratitude for doing so! Our Lord is infinitely Generous! Indeed, those who recite the Book of Allah and establish prayer and spend [in His cause] out of what We have provided them, secretly and publicly, [can] expect a profit that will never perish. That He may give them in full their rewards and increase for them of His bounty. Indeed, He is Forgiving and Appreciative. Donate Title to contribute to other funds.